Here’s a short post to answer a straight-forward question: do pitchers that throw more pitches pitch more slowly? If it’s not clear, the idea is that a pitcher who throws several pitches frequently will take longer because the catcher has to spend more time calling the pitch, perhaps with a corresponding increase in how often the pitcher shakes off the catcher. To make a quick pass at this, I pulled FanGraphs data on how often each pitcher threw fastballs, sliders, curveballs, changeups, cutters, splitters, and knucklers, using data from 2009–13 on all pitches with at least 200 innings. (See the data here. There are well-documented issues with the categorizations, but for a small question like this they are good enough.) The statistic used for how quickly the pitcher worked was the appropriately named Pace, which measures the number of seconds between pitches thrown. To easily test the hypothesis, we need a single number to measure how even the pitcher’s pitch mix is, which we believe to be linked to the complexity of the decision they need to make. There are many ways to do this, but I decided to go with the Herfindahl-Hirschman Index, which is usually used to measure market concentration in economics. It’s computed by squaring the percentage share of each pitch and adding them together, so higher values mean things are more concentrated. (The theoretical max is 10,000.) As an example, Mariano Rivera threw 88.9% cutters and 11.1% fastballs over the time period we’re examining, so his HHI was . David Price threw 66.7% fastballs, 5.8% sliders, 6.6% cutters, 10.6% curveballs, and 10.4% changeups, leading to an HHI of 4746. (See additional discussion below.) If you’re curious, the most and least concentrated repertoires split by role are in a table at the bottom of the post. As an aside, I find two people on those leader/trailer lists most interesting. The first is Yu Darvish, who’s surrounded by junkballers—it’s pretty cool that he has such amazing stuff and still throws 4.5 pitches with some regularity. The second is that Bartolo Colon has, according to this metric, less variety in his pitch selection over the last five years than the two knuckleballers in the sample. He’s somehow a junkballer but with only one pitch, which is a pretty #Mets thing to be. Back to business: after computing HHIs, I split the sample into 99 relievers and 208 starters, defined as pitchers who had at least 80% of their innings come in the respective role. 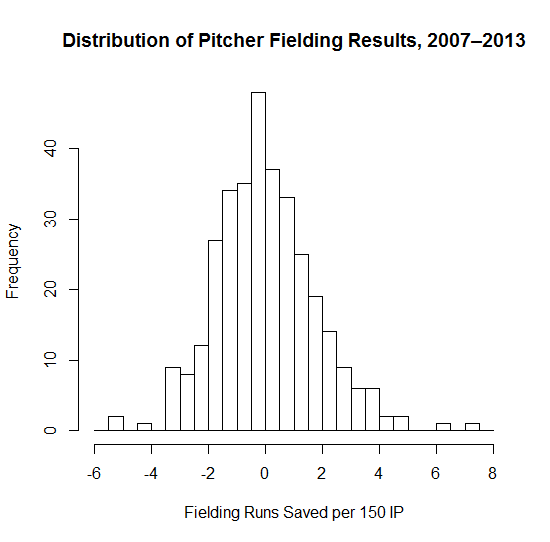 I enforced the starter/reliever split because a) relievers have substantially less pitch diversity (unweighted mean HHI of 4928 vs. 4154 for starters, highly significant) and b) they pitch substantially slower, possibly due to pitching more with men on base and in higher leverage situations (unweighted mean Pace of 23.75 vs. 21.24, a 12% difference that’s also highly significant). So, how does this HHI match up with pitching pace for these two groups? Pretty poorly. The correlation for starters is -0.11, which is the direction we’d expect but a very small correlation (and one that’s not statistically significant at p = 0.1, to the limit extent that statistical significance matters here). For relievers, it’s actually 0.11, which runs against our expectation but is also statistically and practically no different from 0. Overall, there doesn’t seem to be any real link, but if you want to gaze at the entrails, I’ve put scatterplots at the bottom as well. One important note: a couple weeks back, Chris Teeter at Beyond the Box Score took a crack at the same question, though using a slightly different method. Unsurprisingly, he found the same thing. If I’d seen the article before I’d had this mostly typed up, I might not have gone through with it, but as it stands, it’s always nice to find corroboration for a result. Boring methodological footnote: There’s one primary conceptual problem with using HHI, and that’s that in certain situations it gives a counterintuitive result for this application. For instance, under our line of reasoning we would think that, ceteris paribus, a pitcher who throws a fastball 90% of a time and a change 10% of the time would have an easier decision to make than one who throws a fastball 90% of the time and a change and slider 5% each. However, the HHI is higher for the latter pitcher—which makes sense in the context of market concentration, but not in this scenario. (The same issue holds for the Gini coefficient, for that matter.) There’s a very high correlation between HHI and the frequency of a pitcher’s most common pitch, though, and using the latter doesn’t change any of the conclusions of the post. This entry was posted in Baseball, Research, Splits and tagged Game length, Pitching, splits on May 9, 2014 by clownhypothesis. In my experience with introductory statistics classes, both ones I’ve taken and ones I’ve heard about, they typically have two primary phases. The second involves hypothesis testing and regression, which entail trying to evaluate the statistical evidence regarding well-formulated questions. (Well, in an ideal world the questions are well-formulated. Not always the case, as I bitched about on Twitter recently.) This is the more challenging, mathematically sophisticated part of the course, and for those reasons it’s probably the one that people don’t remember quite so well. What’s the first part? It tends to involve lots of summary statistics and plotting—means, scatterplots, interquartile ranges, all of that good stuff that one does to try to get a handle on what’s going on in the data. Ideally, some intuition regarding stats and data is getting taught here, but that (at least in my experience) is pretty hard to teach in a class. Because this part is more introductory and less complicated, I think this portion of statistics—which is called exploratory data analysis, though there are some aspects of the definition I’m glossing over—can get short shrift when people discuss cool stuff one can do with statistics (though data visualization is an important counterpoint here). A slightly more complex technique one can do as part of exploratory data analysis is principal component analysis (PCA), which is a way of redefining a data set’s variables based on the correlations present therein. While a technical explanation can be found elsewhere, the basic gist is that PCA allows us to combine variables that are related within the data so that we can pack as much explanatory power as possible into them. One classic application of this is to athletes’ scores in the decathlon in the Olympics (see example here). There are 10 events, which can be clustered into groups of similar events like the 100 meters and 400 meters and the shot put and discus. If we want to describe the two most important factors contributing to an athlete’s success, we might subjectively guess something like “running ability” and “throwing skill.” PCA can use the data to give us numerical definitions of the two most important factors determining the variation in the data, and we can explore interpretations of those factors in terms of our intuition about the event. So, what if we take this idea and apply it to baseball hitting data? This would us allow to derive some new factors that explain a lot of the variation in hitting, and by using those factors judiciously we can use this as a way to compare different batters. This idea is not terribly novel—here are examples of some previous work—but I haven’t seen anyone taking the approach I have now. For this post, I’m focused more on what I will call hitting style, i.e. I’d like to divorce similarity based on more traditional results (e.g. home runs—this is the sort of similarity Baseball-Reference uses) in favor of lower order data, namely a batter’s batted ball profile (e.g. line drive percentage and home run to fly ball ratio). However, the next step is certainly to see how these components correlate with traditional measures of power, for instance Isolated Slugging (ISO). I then ran the PCA on these data in R, and here are the first two components, i.e. the two weightings that together explain as much of the data as possible. (Things get a bit harder to interpret when you add a third dimension.) All data are normalized, so that coefficients are comparable, and it’s most helpful to focus on the signs and relative magnitudes—if one variable is weighted 0.6 and the other -0.3, the takeaway is that the first is twice as important for the component as the second and pushes that component in the opposite direction. 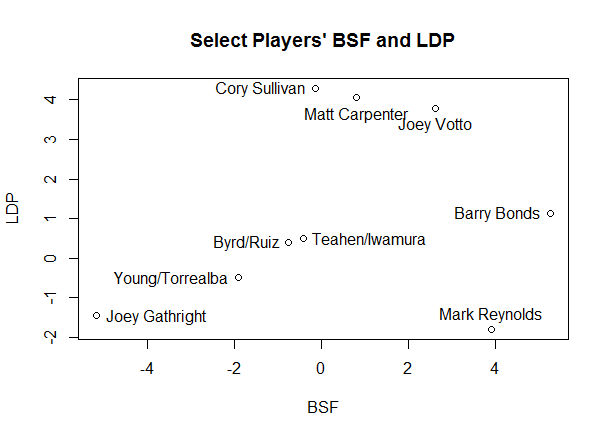 These actually map pretty closely onto what some of our preexisting ideas might have been: the guys with the highest BSF are some of the archetypal three true outcomes players, while the guys with the high LDP are guys we think of as being good hitters with “doubles power,” as it were. It’s also interesting to note that these are not entirely correlated with hitter quality, as there’s some mediocre players near the top of each list (though most of the players at the bottom aren’t too great). That suggests to me that this did actually a pretty decent job of capturing style, rather than just quality (though obviously it’s easier to observe someone’s style when they actually have strengths). One final thing for this post: given that we have plotted these like coordinates, we can use the standard measure of distance between two points as a measure for similarity. For this, I’m going to change tacks slightly and use the first The two players most like each other in this sample form a slightly unlikely pair: Marlon Byrd, with coordinates (-0.756, 0.395), and Carlos Ruiz (-0.755, 0.397). As you see below, if you look at their batted ball profiles, they don’t appear to be hugely similar. I spent a decent amount of time playing around with this; if you increase the number of components used from two to three or more, the similar players look much more similar in terms of these statistics. However, that gets away from the point of PCA, which is to abstract away from the data a bit. 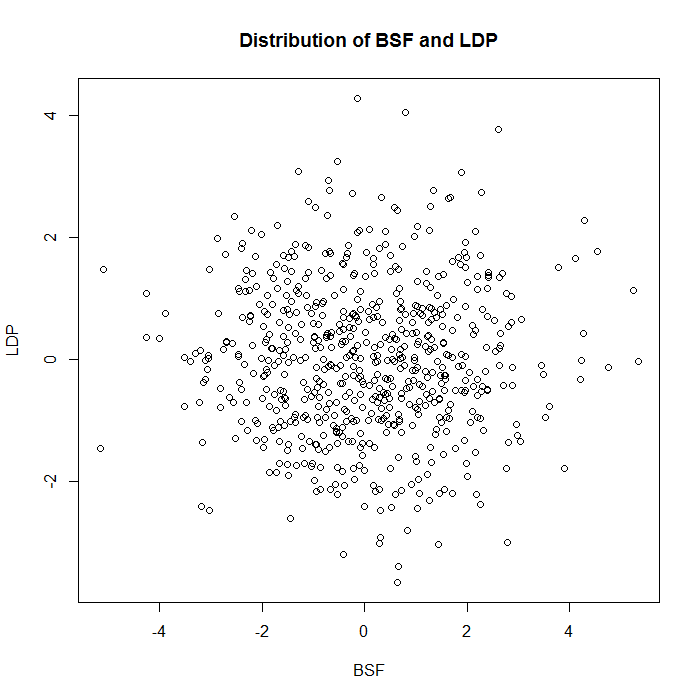 Thus, these pairs of similar players are players who have very similar amounts of BSF and LDP, rather than players who have the most similar statistics overall. Another pair that’s approximately as close as Ruiz and Byrd is Mark Teahen (-0.420,-0.491) and Akinori Iwamura (-0.421,-0.490), with the third place pair being Yorvit Torrealba (-1.919, -0.500) and Eric Young (-1.909, -0.497), who are seven times farther apart than the first two pairs. Who stands out as outliers? It’s not altogether surprising if you look at the labelled charts above, though not all of them are labelled. (Also, be wary of the scale—the graph is a bit squished, so many players are farther apart numerically than they appear visually.) Joey Gathright turns out to be by far the most unusual player in our data—the distance to his closest comp, Einar Diaz, is more than 1000x the distance from Ruiz to Byrd, more than thirteen times the average distance to a player’s nearest neighbor, and more than eleven standard deviations above that average nearest neighbor difference. In this case, though, having a unique style doesn’t appear to be beneficial. You’ll note Gathright is at the bottom of the BSF list, and he’s pretty far down the LDP list as well, meaning that he somehow stumbled into a seven year career despite having no power of any sort. Given that he posted an extremely pedestrian 0.77 bWAR per 150 games (meaning about half as valuable as an average player), hit just one home run in 452 games, and had the 13th lowest slugging percentage of any qualifying non-pitcher since 1990, we probably shouldn’t be surprised that there’s nobody who’s quite like him. To reiterate what I just said about Gathright, style doesn’t necessarily correlate with results. Cory Sullivan hit a lot of line drives (28.2%, the largest value in my sample—the mean is 20.1%) and popped out infrequently (3%, the mean is 10.1%). His closest comps are Matt Carpenter and Joe Mauer, which is pretty good company. And yet, he finished as a replacement level player with no power. Baseball is weird. 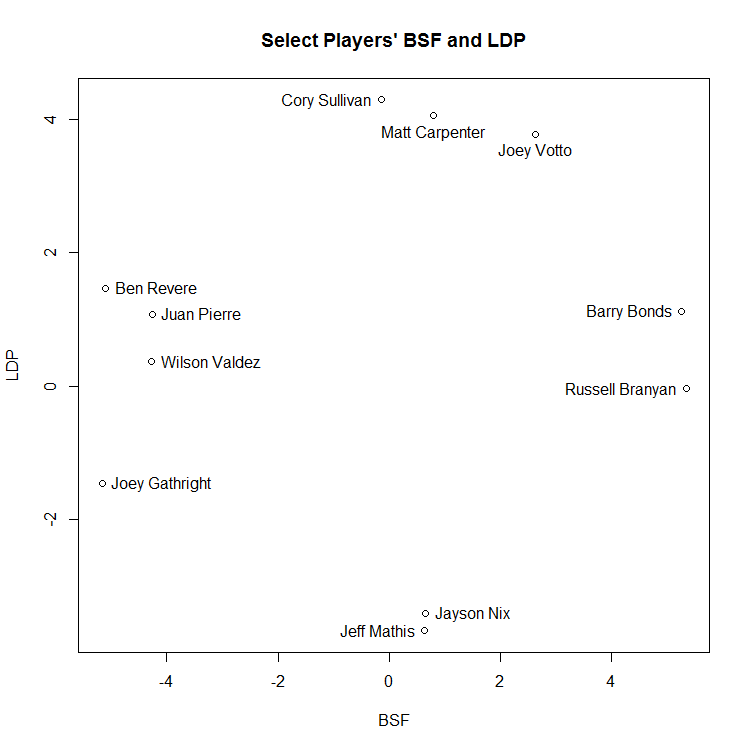 This is a bit of a lengthy post without necessarily an obvious point, but, as I said at the beginning, exploratory data analysis can be plenty interesting on its own, and I think this turned into a cool way of classifying hitters based on certain styles. An obvious extension is to find some way to merge both results and styles into one PCA analysis (essentially combining what I did with the Bill James/BR Similarity Score mentioned above), but I suspect that’s a big question, and one for another time. This entry was posted in Baseball, Research and tagged Barry Bonds, Batted Balls, Categorization, Joey Gathright, PCA, Similarities on February 9, 2014 by clownhypothesis. When discussing Marshawn Lynch, one of them brought out the old chestnut that big running backs wear down the defense and thus are likely to get big chunks of yardage toward the end of games, citing Jerome Bettis as an example of this. This is accepted as conventional wisdom when discussing football strategy, but I’ve never actually seen proof of this one way or another, and I couldn’t find any analysis of this before typing up this post. 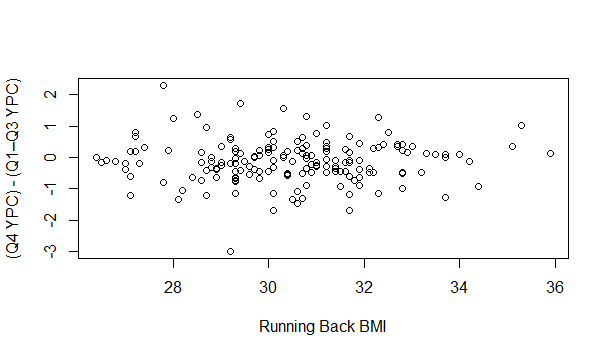 Bigger running backs are determined by weight, BMI, or both. I’m using Pro Football Reference data for this, which has some limitations in that it’s not dynamic, but I haven’t heard of any source that has any dynamic information on player size. Late in games is the simplest thing to define: fourth quarter and overtime. Before I dive into my conclusions, I want to preemptively bring up a big issue with this, which is that it’s only on aggregate level data. This involves pairing up data from different games or even different years, which raises two problems immediately. 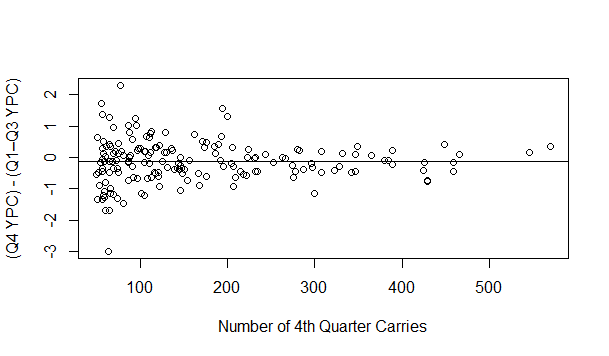 The first is that we’re not directly testing the hypothesis; I think it is closer in spirit to interpret as “if a big running back gets lots of carries early on, his/his team’s YPC will increase in the fourth quarter,” which can only be looked at with game level data. I’m not entirely sure what metrics to look at, as there are a lot of confounds, but it’s going in the bucket of ideas for research. The second is that, beyond having to look at this potentially effect indirectly, we might actually have biases altering the perceived effect, as when a player runs ineffectively in the first part of the game, he will probably get fewer carries at the end—partially because he is probably running against a good defense, and partially because his team is likely to be behind and thus passing more. This means that it’s likely that more of the fourth quarter carries come when a runner is having a good day, possibly biasing our data. Finally, it’s possible that the way that big running backs wear the defense down is that they soften it up so that other running backs do better in the fourth quarter. This is going to be impossible to detect with aggregate data, and if this effect is actually present it will bias against finding a result using aggregate data, as it will be a lurking variable inflating the fourth quarter totals for smaller running backs. Now, I’m not sure that either of these issues will necessarily ruin any results I get with the aggregate data, but they are caveats to be mentioned. I am planning on redoing some of this analysis with play-by-play level data, but those data are rather messy and I’m a little scared of small sample sizes that come with looking at one quarter at a time, so I think presenting results using aggregated data still adds something to the conversation. The guy in the top right, who’s very consistent and very good? Jamaal Charles. His YPC increases by about 0.01 yards in the fourth quarter, the second smallest number in the data (Chester Taylor has a drop of about 0.001 yards). The outlier in the bottom right, meaning a major dropoff, is Darren Sproles, who has the highest early game YPC of any back in the sample. The outlier in the top center with a major increase is Jerious Norwood. The back on the left with the lowest early game YPC in our sample is Mike Cloud, whom I had never heard of. He’s the only guy below 3 YPC for the first three quarters. However, that lurking variable doesn’t appear to be running back size. 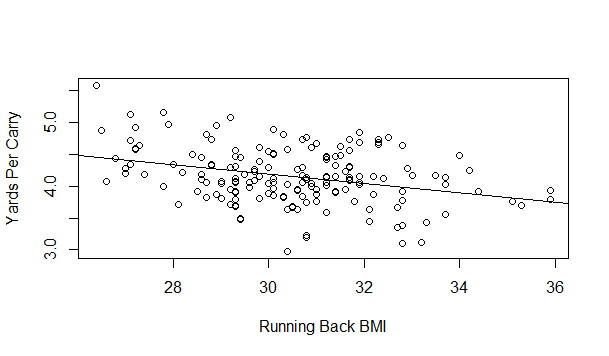 Below is a plot showing running back BMI vs. (Q4 YPC – Q1–3 YPC); there doesn’t seem to be a real relationship. 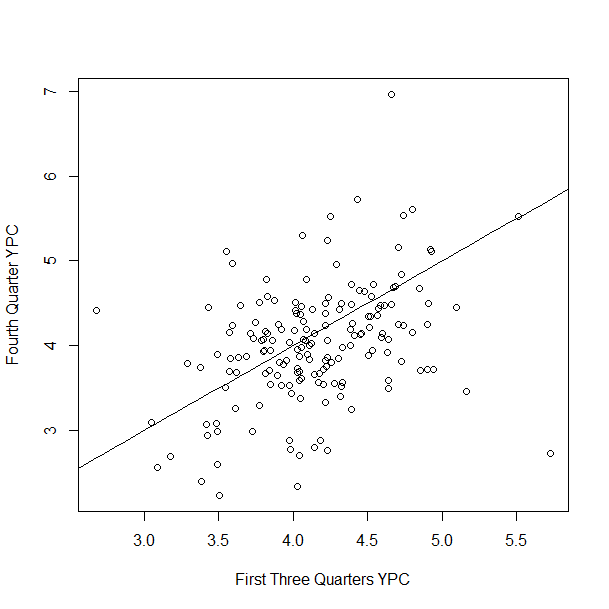 The plot below it shows difference and fourth quarter carries (the horizontal line is the average value of -0.13), which somewhat suggests that this is an effect that decreases with sample size increasing, though these data are non-normal, so it’s not an easy thing to immediately assess. That intuition is borne out if we look at the correlation between the two, with an estimate of 0.02 that is not close to significant (p = 0.78). Using weight and height instead of BMI give us larger apparent effects, but they’re still not significant (r = 0.08 with p = 0.29 for weight, r = 0.10 with p = 0.21 for height). Throwing these variables in the regression to predict Q4 YPC based on previous YPC also doesn’t have any effect that’s close to significant, though I don’t think much of that because I don’t think much of that model to begin with. Our talking head, though, mentioned Lynch and Bettis by name. Do we see anything for them? Unsurprisingly, we don’t—Bettis has a net improvement of 0.35 YPC, with Lynch actually falling off by 0.46 YPC, though both of these are within one standard deviation of the average effect, so they don’t really mean much. On a more general scale, it doesn’t seem like a change in YPC in the fourth quarter can be attributed to running back size. My hunch is that this is accurate, and that “big running backs make it easier to run later in the game” is one of those things that people repeat because it sounds reasonable. However, given all of the data issues I outlined earlier, I can’t conclude that with any confidence, and all we can say for sure is that it doesn’t show up in an obvious manner (though at some point I’d love to pick at the play by play data). At the very least, though, I think that’s reason for skepticism next time some ex-jock on TV mentions this. This entry was posted in Announcing, Football, Research, Splits and tagged Big Running Backs, British TV, NFL on January 28, 2014 by clownhypothesis. But here’s the problem with that analogy: No manager would ever burn his best pinch hitter in the first inning, right? Even if the bases were loaded, and Clayton Kershaw was pitching, and you might never have a chance this good again. No manager would do that? In the same way that no manager would ramble on and on when speaking before the Senate Antitrust Subcommittee. That is to say, Casey Stengel would do it. Baseball Reference doesn’t have the best interface for this, and it would have taken me a while to dig this out of Retrosheet, but Google led me to this managerial-themed quiz, which led me in turn to the Yankees-Tigers game from June 10, 1954. Casey pinch hit in the first inning—twice! I’m sure there are more examples of this, but this was the first one I could find. Casey Stengel: great manager, and apparently immune to rhetorical questions. This entry was posted in Baseball, History, Oddities, Research, Sportswriters and tagged Casey Stengel. Managing, Jayson Stark, Replay on January 17, 2014 by clownhypothesis.